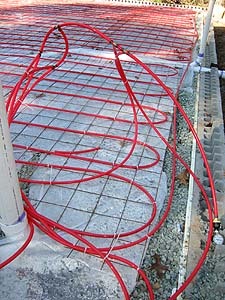 After a plastic moisture barrier was placed on the gravel, ½" Vanguard Hydronic tubes were securely fastened to a metal frame with nylon cable ties. 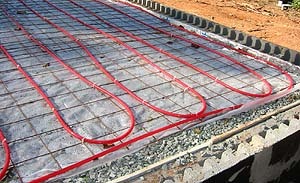 Three different zones all connect together to provide even floor heating. 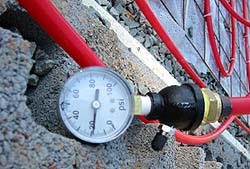 The pipes were air pressurized to 20 psi. This gauge will be monitored during the pouring of the slab and during the entire construction process to ensure pressure remains constant without leaks and that there is no damage to the tubes from any phase of the construction. 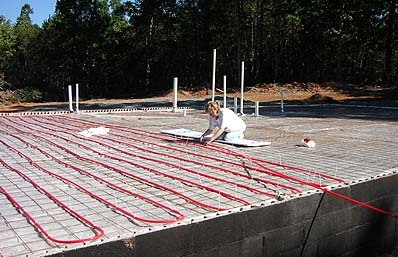 Radiant floor heat pipes are installed. 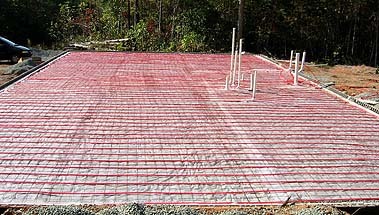 Now ready for slab to be poured.